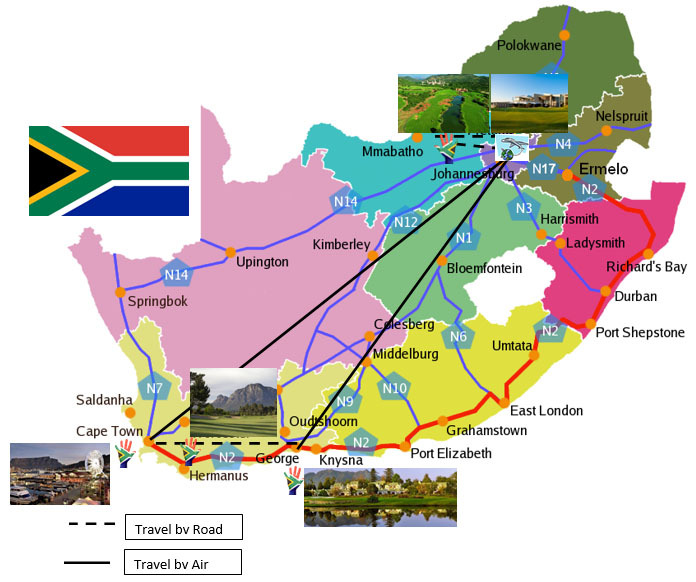 Get a taste of South Africa: Blue sky, sun shine and one of the most famous game reserves on this 8-day Golf Tour. The tour leader and guide will meet you at 12 midday at the international arrival hall at OR Tambo. This will allow the TK40 flight to join us. They will be waiting with a sign of MAG Tours as seen on the right hand corner of this page. Please wait for them at the info desk and phone +27 83 628 3861 if you do not see them. At arrival you will have to confirm your details, mark your luggage and meet the rest of the group. At 12h30 we depart for Sun City that is a 3 hour drive from the airport. You will drive through the city of Johannesburg and travel from east to west through this industrial capital of South Africa. The vibrant life style and busy people rushing from point A to B. Next we reach the playground of the city yuppies – Hartebeestpoortdam. Yachts drifting on the lake with a calmness that inspires artists! Vibrant African markets and people selling along the road. We stop for 30 min to stretch a leg and give you time to test your negotiation skills – if you wish to. We will arrive at the Sun City Cabanas Hotel and book into your lux room sharing with another golfer. You will leave for a game drive that evening to the park. Time to be confirmed closer to date. Stay in a beautiful Cabanas hotel in Sun City – on the edge of the Pilanesberg Game Reserve. Spend days play the top international standard golf courses and take a drive to spot the remarkable animals that make the park their home – leopards, lions, elephants, giraffe, rhino, and hippos, antelope species, buffalo are just some of the wild and wonderful creatures to observe. After exciting days exploring the open savanna, relax in the evenings eating traditional foods and listening to the nocturnal symphony of this incredible destination and enjoying your round of golf. Experience more than 57000hectares of open land, natural resources in a spectacular ecosystem. Possible to see the big 7 on your trips through the park- Rhino, lion, elephant, buffalo, leopard, hippo and crocodile. Not mentioning all the birdlife and smaller creature that can make your stay an experience of life time! The next morning you can enjoy a buffet breakfast before you make your way to the Gary Player Golf course for a round of golf. Your first day of golfing on your tour. This is a SAGA priced course and quoted accordingly. Only walking. At 16h00 we will depart back to Johannesburg to overnight in a lux room (sharing) at the famous Fairway Hotel. On our way we will stop at Carnivores Restaurant – the meat and eats for Africa! All kinds of wild animal meat and domestic meat. 20:00 Arrive at your hotel for a good night’s rest. Breakfast included before a round of golf at the Fairway Hotel’s Bushwillow course. A golf cart will be included to ease the game. After lunch (excluded) we depart to OR Tambo airport for take the flight to George in the Western Cape. Flights included. On arrival the driver will be waiting to transfer us to the Fancourt Hotel. All rooms will be sharing with a golf partner. We will have dinner (Excluded) at the hotel. Today we relax and sleep in for a late breakfast. Recharge and enjoy the area after a round of golf at Fancourt’s Outeniqua of Montague with a golf cart included. Additional extras: Visit Knysna for lunch (R350pp) or just take a drive along the coast and take a swim at Victoria Bay (R100pp). The group can choose one activity for the day for transport purposes. We wake up for breakfast and a day of travelling. We can drive straight to De Zalze winelands in the Cape or travel to the Congo Caves and Ostrich farms at Oudthoorn (R450pp) for an additional activity. The trip takes about 5 hours straight. We will stop along the N2. At De Zalze we will share one bedroom villas. After breakfast we will leave on a 30 minute drive to the Pearl Valley Golf Course between Franschoek and Paarl. This is winelands and we will definitely stop on the way back to take the tram and visit some winelands. At 17:00 we will go back to our nest for the night at De Zalze. We end off the golfing for this trip and tomorrow will be site seeing. After breakfast we depart for Cape Town. Today we will visit Boulders on the western side of the peninsula and meet the second biggest penguin colony in the Southern hemisphere. We will continue to Cape Point lighthouse where the two oceans start to meet. On the way back we will stop at Camps Bay for a walk on the cold side of Cape Town with a Miami feel to it. Our last stop will be at the Victoria Albert Waterfront Hotel where we will be booked into the Piazza rooms. The waterfront boasts with lots of restaurants and a vibe from the taverns. You can now relax and enjoy. Lie in and listen to the ocean. Seagull’s calling and fishermen shouting! This is your last day and I hope you have lots of memories to take home. Time to reflect and time for the last shopping and sightseeing! There are markets, shops and Charlies Cake Angels! Table Mountain, Robben Island or just a cruise out to sea! You can take the red bus with its hop-on hop-off to explore the city. All the activities can be booked from the hotel or ask your guide. Please remember that Cape Town is always weather permitting! Breakfast including. Your flight back to Istanbul will only be departing at 17:35 therefore we have to leave at 14:30 to reach Cape Town airport two hours for booking in on flight TK45. If you connect in Johannesburg on another airline the flight times need to be confirm on booking.